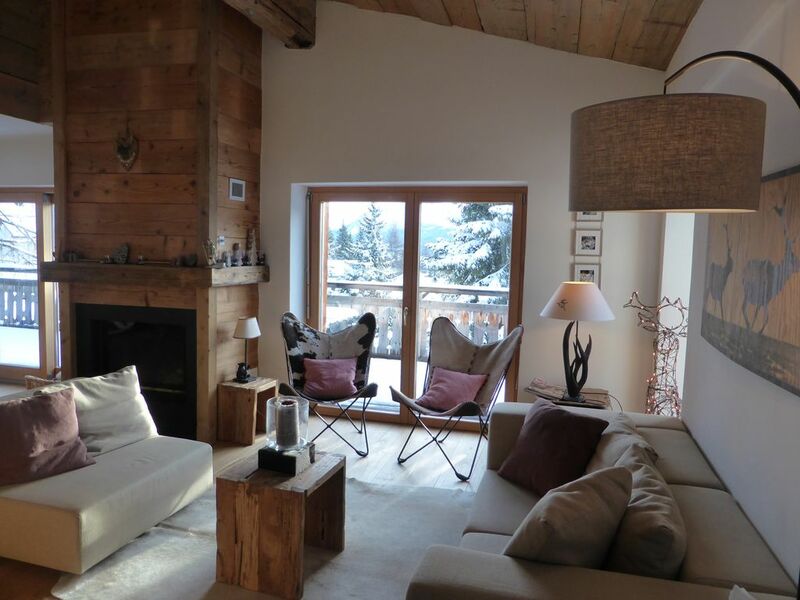 150 m2 large and charming holiday home, overlooking the village center, the ski slopes and the valley. The detached chalet is located on a ground of about 1000 m2 in Crapera (gold hill of Lenzerheide), 10 minutes (1 km) on foot or 2 mn by car from the village center. The house has been completely renovated in Grisons style, with a combination of modern materials and old / antique wood. Furniture respects the mountain style, but the whole remains light with white walls and bright colors such as beige, gray and discreet red. Chalet Chic Deko, delicate and well-kept. The living and dining areas have large windows, giving the impression of flying around the surroundings. They provide optimal brightness and ensure well-being. In winter, you can reach the Rothorn side directly with the ski via this lift. The chalet is equipped as a main residence. Since we have put a lot of heart blood in the renovation and the equipment, well-cared and caring persons are welcome! Our chalet is a haven of peace, tranquility, recreation and happiness. Shower of granite with rain shower head. Wood furniture with a hairdryer. High quality bath towels included. Wunderschönes, gemütliches Chalet, schöner Mix zwischen alt und neu mit viel Liebe zum Detail. Das Haus hat eine angenehme Grösse und bietet jeden möglichen Luxus den man braucht, sehr guten Komfort und hinreichende Schlafmöglichkeiten für eine fünf-köpfige Familie. Es fehlt an nichts, um sich wohl zu fühlen. Die Lage könnte nicht besser sein, die Aussicht ist fantastisch. Der Kontakt mit der Gastgeberin war reibungslos und sehr freundlich. Wir können das Chalet sehr gut weiterempfehlen. Our stay at Lenzerheide could not be better. Weather was more then cooperative, the sentimental journey we had was a once in a lifetime oppertunity. The house is great to enjoy a relaxed time. Quite some houserules more or less all about respecting materials and house as it is - so i guess rather normal. Views from the balcony are stunning - where you dream on whenever you stay in the Alps. Sophie thanks a lot for your patience and care. We had a very nice time in this chalet , very well equipped and nice layout for a family with kids. It was super clean and comfortable and we loved the views onto the mountains. Hope to be able to come back again ! Winter activities: skiing with direct connection to the Arosa: a single package for both skiing in Lenzerheide Arosa to 225 km of slopes to 2 865 m! 42 transport facilities on three sides. Cross-country skiing 56 km of slopes. Toboggan runs, Scharmoin (3. 8 km), even at night or Tgantieni (1. 5 km). Winter hiking 80 km of marked trails and prepared daily and on the frozen lake, possible link to Arosa! Outdoor natural ice rink in the village center and indoor ice rink for skating: ice skating, ice hockey, curling. Beautiful municipal swimming pool with outdoor part to 175 m2, wellness area and fitness room heated to 35 ° C.
Summer activities: hiking 170 km of marked trails, walking. Special routes for children: Globi Trail discoveries with 14 stations. Beach and landscaped with several play areas for children, outdoor grills, beach volleyball, windsurfing, pedal boats lake. 300km of marked trails for cycling, mountain bike trails, bike park, freeride. Summer scooter on track 3. 8 km away. Summer toboggan on a stretch of 3 1 km, Tree climbing. Lenzerheide Golf Club with 18 holes. Tennis club with 5 outdoor clay courts and an indoor area. Swimming pool with outdoor part, wellness, fitness and mini golf. Fishing. Program of activities for children during school holidays.